Too often, important files, images, and other collateral are misplaced and misused. It would be so much easier if everything lived in the same searchable, secure location, right? We created this guide to help you elevate your brand with better file organization, sharing, and analytics in order to keep your content and your sanity in check. 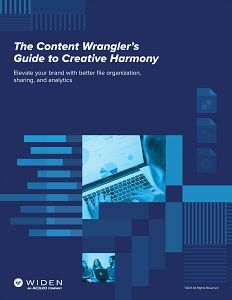 Filled with tips, success stories, and even assessments to help you determine your organization’s current “creative harmony” status, this guide introduces you to the world of digital asset management (DAM) and what it can do for you. Download the guide now and get started on your DAM journey today.